In the design, we have minimized the number of seams. In order not to irritate your baby’s sensitive skin, all labels are on the outside of the garments, in the same colour as the logo-ribbon. The BEIBAMBOO® logo ribbon covers the seam, that has been sewn on to the external side of the clothes, so the inside is perfectly smooth. The generous clothing models allow all kinds of nappies and the clothes grow with you baby due to double row of poppers. All our poppers and zippers are nickel-free, and because they are not colour coated, they will never look faded or scratched, as is often the case with cheaper baby-wear. All baby clothing materials all Öko Tex 100 certified, which means they are absolutely toxin-free, pesticide-free and heavy-metal free. As we do not want to unduly overload the already suffering water systems of the world with chemical dyes, we have chosen to only produce our garments in milky white. The dyes in the logo ribbon and our labels are AZO free. 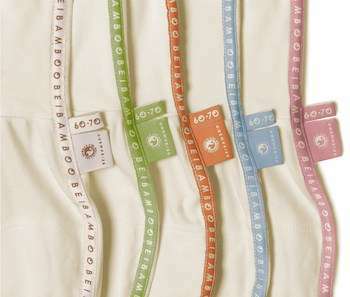 • The BEIBAMBOO logo ribbon covers the seams sewn on the external side (Pat.Pending PCT/FI2011/050002).